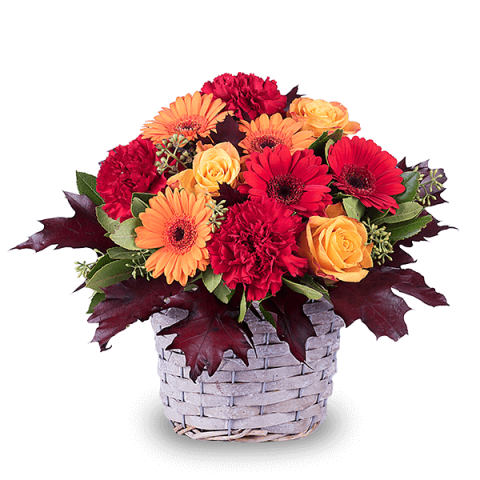 Orange and red gerberas paired with red carnations and orange roses in a charming wicker basket. Send this joyful and warm arrangement of flowers to friends and family wherever they may be with FloraQueen. Send flowers to over 100 countries today. This November share a kind gift with your family and friends with our range of Thanksgiving 2017 flowers. The world has changed a great deal since Thanksgiving was first celebrated back in the 17th century. But, at heart, the event itself remains true to what it was like back then, focusing on the values of togetherness, tasty food and the bountiful beauty of nature. It is perhaps the only time of year when family gather around the table to eat, chat and, of course, give thanks for the good things in their lives. And what better way to let your friends and family know that you’re thinking of them on this special day than with a bouquet of wonderfully fresh flowers. All the splendid colours of Autumn make an appearance, including golds, reds and oranges, as well as classic shades of white. All make a marvellous centrepiece for the Thanksgiving table itself. Just picture the scene: the whole family together, the table brimming with all the traditional fare, and, there in the middle, your stunning flower arrangement. Bring a real touch of nature to the table and show your appreciation in a special way that will brighten up the room. At FloraQueen we are well aware that there are times of year when it’s particularly hard to be far from friends and family. Thanksgiving is one of them, without a doubt. But our international flower delivery service means that you can be right there, at the heart of the celebrations, in spirit if not in person.